Going grain-free doesn’t mean you have to miss out on the delicious addition of cornbread when enjoying your favorite soups, stews and chili. Instead, these slightly sweet and savory grain-free “cornbread” muffins taste so close, you’d almost swear there’s corn in them. But, there isn’t! Yay! P.S. The secret to these mock-cornbread muffins being such a cheerful yellow hue is the use of real pastured eggs. Their bright orangy-yellow yolks are perfect for enhancing both the eye appeal and most important – the nutritional value of your favorite meals! Preheat oven to 350 degrees F. Line a 12-cup muffin tin with 10 paper muffin liners. Slice the jalapeno, making sure to remove the seeds from the slices; set aside. In a small bowl, add the almond flour, coconut flour, baking powder and salt. In a large bowl, whisk together the melted butter and honey, until creamy. Then, whisk in the eggs, yogurt and apple cider vinegar, until well combined. Add the dry ingredients to the wet, whisking to ensure no lumps remain. Use a rubber spatula to fold in the cheddar cheese and fine-chopped green chiles (or jalapeños). Green chiles are my personal favorite, because they really add a depth of flavor to the muffins. 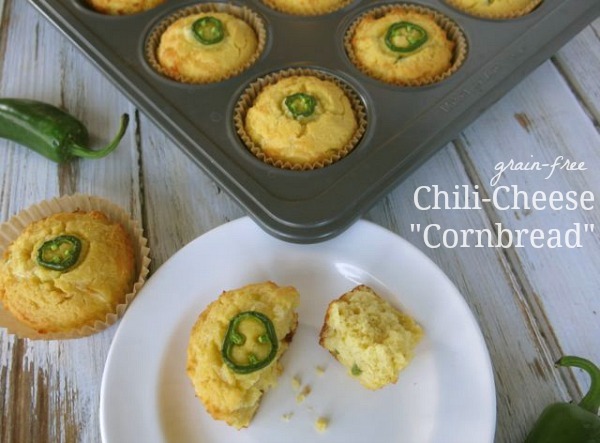 I find these muffins to be a little plain without them – or fine diced jalapeños, if you prefer a little heat instead. Remember, if using jalapeños, "less is more" unless you can withstand the heat. 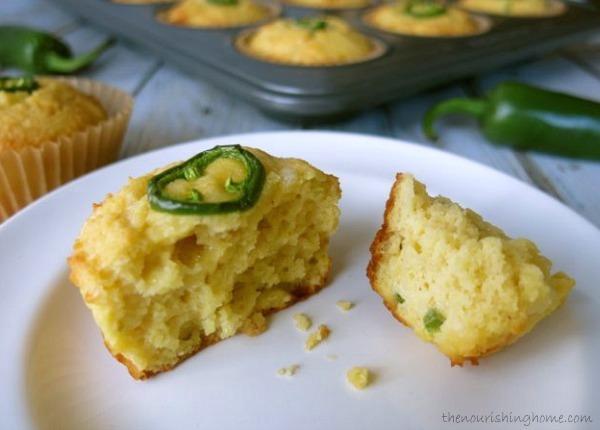 Evenly distribute the batter among the muffin cups and top with a jalapeno slice for the cute factor. Bake for approximately 20-25 minutes, until slightly browned around edges and a toothpick inserted in the center comes out clean. Allow muffins to cool in tin about 5 minutes, then serve warm with your favorite soups, stews and chili. Yum! Extra muffins can be frozen for a future meal. When ready to use, thaw in fridge overnight and then reheat in toaster oven set at 200 degrees for 8-10 minutes. Looks awesome! Could the cheese and chiles be ommitted? I can’t do almond flour. Any suggestion for an alternative to that? Is there a substitute for coconut flour? Hi Kelly, I was wondering if I can substitute greek yogurt for the whole milk yogurt or coconut yogurt? I don’t have any yogurt right now. Would sour cream work?